It’s good to see Theodore Sturgeon’s More Than Human kept in print through the SF Masterworks series. Sturgeon is probably more famed for his pronouncements on SF (Sturgeons law, which states that “90% of science fiction is crap, but that’s because 90% of everything is crap”) and The Simpsons, Treehouse of Horror VII (if you’re interested, The Genesis Tub section is based on Sturgeon’s The Microcosmic God). Oh and, of course, the recurring character of Kilgore Trout in many of Kurt Vonnegut’s novels is based on Sturgeon. Originally published in 1953, this novel has aged well. There are a couple of reasons for this. Firstly, though it’s clearly SF, it’s not futuristic SF with all the attendant problems of predicting the future. It could really be set at any time and in any place. Not to suggest that prediction is the science fiction writers job; I am inclined to think, however, that in spite of FTL drives constructed on the principle of handwavium and powered with the magic of unobtanium that necessarily still exist in SF, authors do generally make a bit more of an effort not to write things that are simply ridiculous. Well, at least, that’s my perception. I may be wrong. The second reason that this stands up well is purely that the writing is excellent. More Than Human tells the story of a post-human Gestalt, or group-mind. Sturgeon explores the philosophical ramifications of such a being. The perception of the world by a Gestalt is not necessarily ours; though, one could just as easily argue that the only perception of the world you can truly understand is your own. It is perhaps better to suggest that the hivemind doesn’t have quite the same set of morals that human beings choose to constrain themselves with. For all the philosophising More Than Human does touch on ordinary human lives, too. There is commentary on growing up, injustice and grief. The novel opens with a feeble-minded young man, who has no name and is barely able to communicate with those around him (though he is able to influence others to do things for him, this mechanism has allowed him to survive into adulthood). Until the opening of the novel, he’d drifted through life in this way; an encounter with a young girl, who has been repressed throughout her life by her father, proves to be pivotal. The incident upon his meeting with her leads to him being taken in by a farming couple, here he manages to name himself (“Lone,” for that’s what he is). We are also introduced to a girl, Janie, who it transpires has pyschokinetic powers, two young twins, who are able to disappear and reappear as they please and a handicapped baby. All of these people have some kind of lack, whether, as in the case of Lone it is an inability to relate to anyone around him (and his feeble-mindedness), or the fact that “Baby” is severely handicapped too. The problems that the twins have are more social than anything else. Being black in 1950s America does mean that they find that they are not permitted to eat at the same table as the rest of the group by their superficially kind and well-mannered benefactor. The Gestalt in this novel, though powerful, is not some kind of omnipotent or invincible superman. It is however, at the risk of cliché, clearly more than the sum of its parts. The individual within the entity is subsumed, though each is required. Lone, for example, is the face and voice of the Gestalt, whilst Baby it’s brain and the twins act as limbs. This is illustrated about a third of the way through the novel after a switch in narrative style takes us into the group-mind. The opening part of the novel “The Fabulous Idiot” sees the birth of the group mind, the second part, “Baby is Three” (also published as a stand-alone short-story), sees the maturation of the being as it learns to live in the world. “Baby is Three” is told as a psychiatric session involving Gerry, a discarded young boy, who has become something of a moral vacuum and later becomes part of the Gestalt. The events that led him to the psychiatrist are told in flashback, giving us a flavour of what had happened over the previous few years. The final part, “Morality,” deals (funnily enough) with the beings moral sense. It should be noted that though the More Than Human is, on the whole, well-paced and never dull, it doesn’t give you any particular answers. Sturgeon certainly points to some and there is an element of resolution to the book, but he does give you room to interpret things for yourself. Of course, this isn’t to all tastes, but I tend to think that it stops the novel from ending up a trite morality tale. More Than Human has little in the way of science-fictionish technology. The only thing that would really qualify is an anti-gravity device designed and constructed by the Gestalt. But this is a MacGuffin, rather than an attempt by Sturgeon to make his world futuristic. As noted, he speculates more on the way that a hive-mind may live, considers the psychology of this kind of being may have. As such, it is perhaps a good introduction to genre fiction for someone who may be turned off by spaceships and giant robots. An excellent addition to the SF Masterworks range. I’d say that I regret that it’s languished on my shelves so long, but there are plenty of other books that I have not yet had the time to read that I’m sure will be equally good. Regardless, this deserves to remain in print as a superb example of 1950s SF that transcends its pulpy roots. 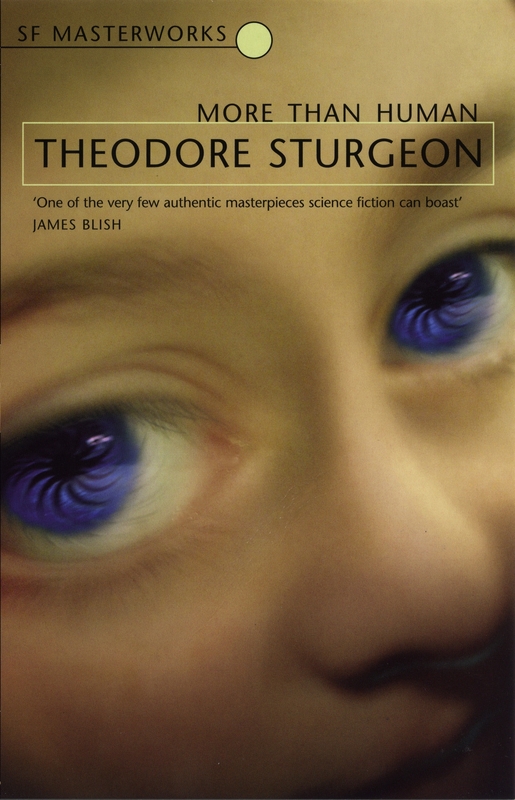 This entry was posted in Review and tagged novel, sf masterworks, theodore sturgeon, usa. Bookmark the permalink. One of my favorites — took me a while to convince myself to read it. However, I was pleasantly surprised — the 50s tend to be somewhat stilted writing wise and I found Sturgeon a pretty good wordsmith at times. Indeed! I like what I’ve read of Sturgeon a lot (and that’s far too little). I’d agree, there’s some stuff I’ve read from that time that I like well enough, but I really couldn’t defend for its godawful prose (It’s a bit later, admittedly, but I’ve been reading Harry Harrison’s Deathworld novels and I’m really struggling. Shame, I used to like him when I was younger).